Thirteen years ago, Olympian and World Champion kayaker Eric Jackson set out on a quest that most any Dad might do. That would be to tinker with the gear, technology, equipment and learning processes that our kids use in hopes of giving them a slightly more fun and enjoyable experience. In Eric's case, he wanted to build a kayak that would fit his son Dane, then 10 years old. People thought Eric was crazy. "What market is there for small kids who want to paddle whitewater?" skeptics would say. Thank you, Eric Jackson, for not listening to the skeptics. 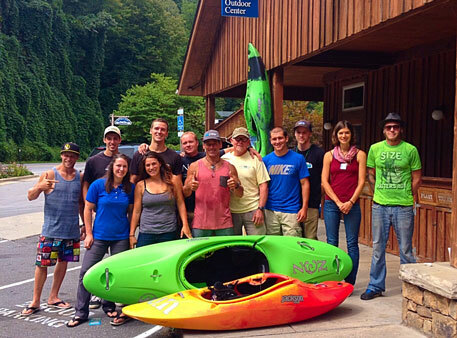 Eric then founded Jackson Kayaks, which changed the whitewater paddlesports industry for kids. In doing this, the Jacksons changed the way I enjoy paddling with my own daughter today. 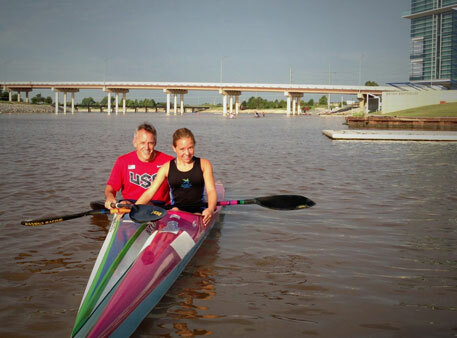 Eric’s success in designing a kid’s kayak brought more families together on the water. In that process, the success of Jackson Kayaks created positive changes within the paddlesports industry—paddles, paddle jackets, spray skirts and helmets, to name a few, “grew smaller” with more kids in mind. Not only did my 14-year-old daughter Seu grow up with paddling accessories and gear that actually fit and were functional, but she had a terrific role model in Eric's daughter, Emily. On a late winter day in 2009 during a trip to the Jackson Kayak factory, we watched while Emily's competition boat came out of the mold. Seu turned to me and excited asked, "They make pink boats?" People frequently ask me for advice about getting their kids engaged in the sport. Naturally, Dads, like me, want to paddle with their kids. So the questions I receive typically revolve around teaching techniques, gear choices, and how to overcome fear of the water. My answer may surprise you. The best way to enjoy the paddlesports with your kids is NOT to focus on kayaking. Instead, focus on the goodness of kayakers. In other words, make it about the people, the paddling community, and the spirit of the sport. From the time Seu was a baby, she was always near the water where she could (and would) interact with paddlers. They would paddle up to her, say hi and give her a few stones from the river or perhaps a foamy kayaker. Seu quickly picked up on not only the independent attributes unique to the sport but the special bonds that bring paddlers closer together. So this Father's Day, as a Dad, I'm grateful for the outstanding character-building system that comes with the sport as a result of the PEOPLE who do it and share it so well. This makes my daughter a wiser, stronger, challenge-seeking and purposeful person with whom to share the water. A decade later, I had the fun of meeting Seu, Lisa, Joe and the dogs at a kayak polo match in San Marcos. It was wonderful to watch Seu, so at ease with this busy, intense and competitive bunch of paddlers. And while I have to credit good parenting for most of who Seu is, being in a village of good people is the support we all need. The paddlers I know are that; an awesome village!